The Kardashians need to seal their beesting lips, and if they won't a judge will seal them for the girls ... at least that's the goal in a new lawsuit against the brood. Haven Beauty is outraged the klan has publicly bashed them. As we first reported, the Kardashians claim the company has falsely represented that Kim, Kourtney and Khloe are behind the makeup line. Haven insists, in new legal docs, the girls are just trying to weasel out of the deal they made, so they're asking a judge for 2 things. First ... an order prohibiting them from talking smack against the company. Haven, who's repped by attorney Gregory Fayer, also wants more than $10 mil for the damaging comments and for turning their back on the deal. 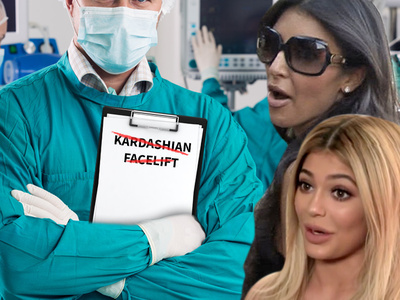 The Kardashians -- Quit Using Us for Facelifts! The Kardashians -- Doctor Slaps Name On Facelifts ... Doggone It!